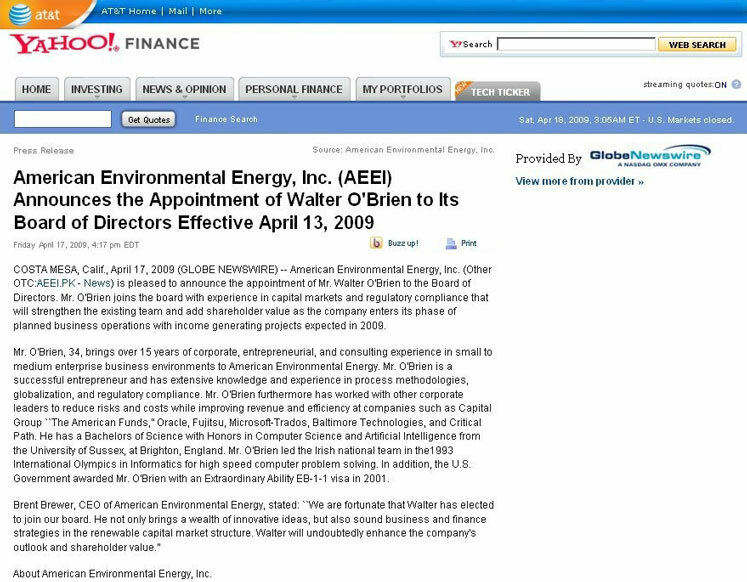 COSTA MESA, Calif., April 17, 2009 (GLOBE NEWSWIRE) -- American Environmental Energy, Inc. (Other OTC:AEEI.PK - News) is pleased to announce the appointment of Mr. Walter O'Brien to the Board of Directors. Mr. O'Brien joins the board with experience in capital markets and regulatory compliance that will strengthen the existing team and add shareholder value as the company enters its phase of planned business operations with income generating projects expected in 2009. Mr. O'Brien, 34, brings over 15 years of corporate, entrepreneurial, and consulting experience in small to medium enterprise business environments to American Environmental Energy. Mr. O'Brien is a successful entrepreneur and has extensive knowledge and experience in process methodologies, globalization, and regulatory compliance. Mr. O'Brien furthermore has worked with other corporate leaders to reduce risks and costs while improving revenue and efficiency at companies such as Capital Group "The American Funds", Oracle, Fujitsu, Mircosoft-Trados, Baltimore Technologies, and Critical Path. He has a Bachelors of Science with Honors in Computer Science and Artificial Intelligence from the University of Sussex, at Brighton, England. Mr. O'Brien led the Irish national team in the 1993 International Olympics in Informatics for high speed computer problem solving. In addition, the U.S. Government awarded Mr. O'Brien with an Extraordinary Ability EB-1-1 visa in 2001. Brent Brewer, CEO of American Environmental Energy, stated: "We are fortunate that Walter has elected to join our board. He not only brings a wealth of innovative ideas, but also sound business and finance strategies in the renewable capital market structure. Walter will undoubtedly enhance the company's outlook and shareholder value."